Most people who are infected with tapeworm have few, if any, symptoms. Symptoms can range from mild to severe, and a tapeworm infestation will not just go away. It will need medical care, especially if the larvae have migrated from the intestinal track and into other parts of the body. Tapeworm eggs are excreted by the host, human or animal, into the soil. The eggs are then ingested by not washing your hands before eating or preparing food. You can also become infected by eating raw or undercooked meats or drinking water contaminated with tapeworm eggs or larvae. If the eggs are ingested, they may develop into larvae, migrate from the intestinal track and invade other body organs or muscle, causing serious medical complications. If larvae are ingested, they usually remain in the intestine, causing few, if any, symptoms. The tapeworms grow, mature, and produce eggs that are then excreted from the body in the stool, and the cycle begins again. Most tapeworm infections in humans are caused by poor hygiene, improper disposal of human or animal feces and eating undercooked freshwater fish, beef or pork. Your mother was correct to constantly remind you to wash your hands before eating, after using the restroom, and after playing in the dirt. 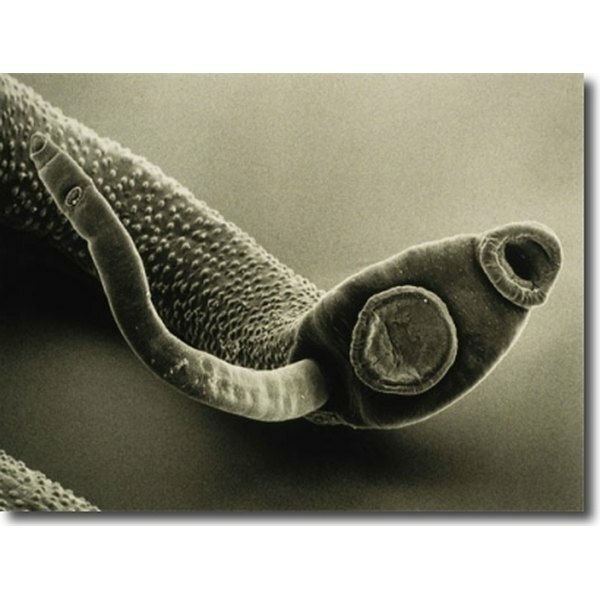 The dwarf tapeworm is the most common tapeworm infection in the world and can complete its entire life cycle in one host. You can also re-infect yourself by ingesting tapeworm eggs excreted in your feces after using the toilet and not properly washing your hands. Dwarf tapeworm infection can also be spread by human-to-human contact from getting eggs on your hands from contaminated stool and then touching food, another person's hands or other objects. Other risk factors include exposure to livestock, frequent travel to developing countries and drinking contaminated water. Tapeworms that remain in the intestine attach to the intestinal wall and can cause irritation and mild inflammation. Intestinal infestation symptoms include seeing tapeworm segments or live worms in your stool, nausea, weakness, loss of appetite, abdominal pain, weight loss from inadequate absorption of nutrients from food and diarrhea. Symptoms of larvae that have migrated out of the intestinal track and into other body tissue or organs may include neurological symptoms, seizure, allergic reaction to larvae, fever, weakness and cystic masses or lumps. Tapeworms can grow up to 50 feet in length and live up to 20 years. To prevent infection, cook all meats to an internal temperature of at least 160 F; cook fish until it is flaky, not rubbery; always thoroughly wash your hands before preparing any food; and eliminate any human or livestock feces properly. Seek medical attention if you have any symptoms.